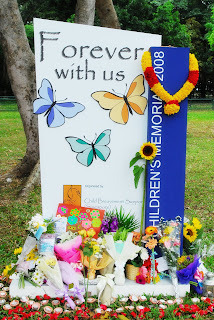 Last Saturday, 1 March 08, Mummy and Daddy attended the Annual Children's Memorial organised by Child Bereavement Support. It's the 2nd time CBS is organising this mass memorial and also the 2nd time we're attending it. We went with a heavy heart and neither of us spoke a word during our long drive there. Last year, we were mourning only 1 child - your Nathaniel KorKor. This year, 3 - with the addition of you and Joash. :( Sometimes we still don't understand why God have to call all 3 of you home so soon. It was a really beautiful and dignified memorial with poetry readings, songs, recitation of children's names and mass balloon release at the end. We released 1 balloon each to all 3 of you at the end of the memorial. Did you receive it? Do you like what mummy has drawn on the card? It's a rainbow which reminds mummy that God's love and mercy are new every morning, even as I still struggle to accept losing you and your KorKors...It's a very silent grief not known to many for it is against the law of Nature for a parent to bury his child. Mummy and Daddy misses you Nathaniel, Joash and Ashley. No baby would be able to take your place in our hearts. You're forever with us.